We are back in the world that H.P. Lovecraft started all those years ago and we are reviewing a graphic novel telling of his once rejected novel At The Mountains Of Madness. Originally published in a serial format in 'Astounding Stories' magazine in 1936, the story has had many versions of it printed over the years. Which brings us to this edition of the novel in graphic form from SelfMade Hero. The story is told in a first-person perspective by Professor Dyer a geologist at the Miskatonic University who hopes to prevent his findings in Antarctica reaching the wider world. What he and his team found in Antarctica will drive any sane man mad and a madman insane. With creatures not of this world and buildings that are too advanced for the time they were built, they discover a lost civilization built by those known as the 'Elder Things'. That is where I will leave telling you more, as this novel needs to be read to fully appreciate the art and storytelling going on through the pages. Taking a story with so much detail and and making it into an easy to grasp read was a tall task, but illustrator and text adaptor I.N.J. Culbard was very much up to the task. Just by the cover alone you can feel the cold desolate land you are about to enter, but upon opening the novel you are met with art thats not to dissimilar to TINTIN. This may put some readers off, especially those who are expecting more of what you seen from the cover. Once you start reading you will find it hard to put this adaptation down as the story is more compact and less wordy then what Lovecraft wrote. Devoted fans to Lovecraft's work may see this as a dumbing down of the mans work but it really just makes it easier to read without endless narrative. It amazes me that even now no film has been made of this novel but considering how much of a fan base there is for the works of Lovecraft you can see why any film studio are wary of adapting it for the screen. Or perhaps they fear the 'Elder Things', but at least you can enjoy this novel in the warmth of your home and just wonder what lies At The Mountains Of Madness. 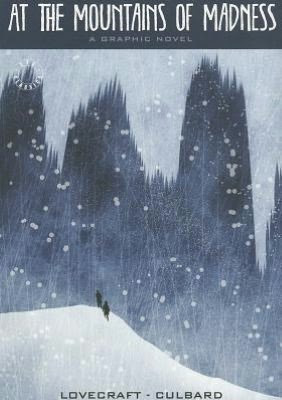 At The Mountains Of Madness - A Graphic Novel is published by SelfMadeHero and is out now. (128 pages, colour. Available in paperback).